Ethics and Religion: January 10, 2018: Column 1899: TIME Spotlights Good News? As a reporter and a former TIME correspondent, I am very impressed with TIME's current issue, "The Optimists." It was edited by Bill Gates, the first-ever guest editor of the magazine, the co-founder of Microsoft, a philanthropist who has given away $35 billion. In his Guest Editorial, Gates argues that too much attention is paid by the media to horrific mass shootings, devastating hurricanes and wars around the globe. He points to evidence that "the world is getting better." "Look at the number of children who die before their fifth birthday," he writes. "Since 1990, that figure has been cut in half. That means 122 million children have been saved in a quarter century, and countless families have been spared the heartbreak of losing a child." He notes that in 1990, more than a third of the global population lived in extreme poverty, making less than $1.90 a day. "Today only a tenth do." As an optimist, he looks for people making progress on these fronts, and with grants helps spread that progress more widely. He asked a number of people why they are optimistic. Belinda Luscombe tipped her hat to Hoda Kotb, who became co-host of NBC's Today show, taking the seat vacated by Matt Lauer, who was fired after allegations of sexual harassment. TIME has counted more than 100 high profile men called out for sexual misconduct since Harvey Weinstein was exposed. And women are getting key jobs. Christiane Amanpour is now hosting a PBS show that featured Charlie Rose for decades, before he was charged with sexual misconduct. Five years ago, one in five children in Ethiopia did not live till their fifth birthday. That mortality rate has been pushed down by two-thirds, "an impressive feat for a low-income nation," TIME asserts. 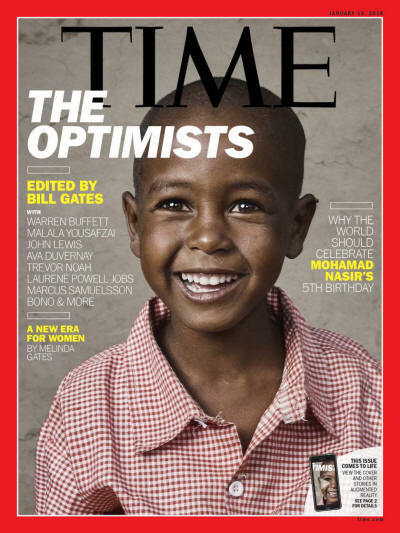 Mohamad Nasir, one of those happy 5-year-olds, is on TIME's cover. Want to help more children reach their fifth birthday? Bill Gates recommends giving to UNICEF and Save the Children. In 2014 I wrote a column about Malala Yousafzai who began writing a diary at age 11, when the BBC called her father, a school principal, and asked for a girl who might write about what it was like as a Christian in Nigeria, who was threatened by the Taliban's determination to stop female education. "Education is our right, just as it is our right to sing," she told her dad. In her first diary entry, published in 2009 under the headline I AM AFRAID, she wrote, "I had a terrible dream last night filled with military helicopters and Taliban." The Taliban set a deadline. Girls had to stop going to school, or suffer grim consequences. In her father's school the number of girls quickly shrank from 27 to 10. A week later the school was closed. Worse, Malala was shot in the head by the Taliban. She survived a number of operations and went back to school. On her 16th birthday, July 13, 2013, she spoke at the UN, asking for free education for every child. She wrote a column in TIME's special issue noting that 130 million girls are out of school but that the UN committed to ensuring every girl receives 12 years of education by 2030, "but contributions from donor countries have either stalled or declined. None of the nine biggest countries in Africa, Latin America and developing Asia have increased their education budgets," she lamented. However, she now leads the Malala Fund which is investing in educators in developing countries, who "understand the challenges girls face in their communities - child marriage, poverty, conflicts and wars...In Afghanistan, they are recruiting female teachers to work in rural schools." Recently she was asked, "After everything you've been through and everything you've seen, how do you keep from being hopeless?" She replied,"It it's pointless to be hopeless. If you are hopeless, you waste your present and your future." However, she closed her column, "Who Runs the World? Girls!" by arguing, "If we want a brighter future - for them and for ourselves - we must invest in girls today." One physician doing so in the Congo is Dr. Denis Mukwege, where he treats women who have been raped, girls assaulted by multiple soldiers. His center in Bukavu has treated more than 50,000 survivors of sexual violence since 1999. His foundation helps these women to "build homes and businesses that employ other women," he asserts. "My hope is that women are not waiting for their freedom to be given by men. Women are realizing that nobody gives them a gift; they have to take it."